Now we are getting interesting… if you like this sort of thing! 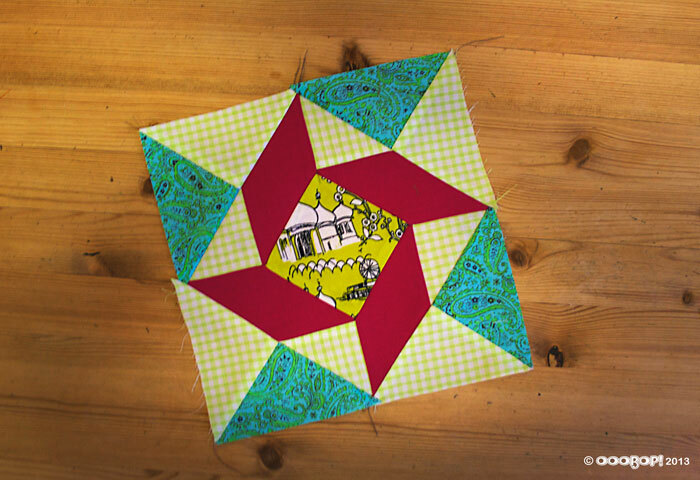 Meet the Windblown Square block. Number 23 from issue 25, The Art of Quilting. It required all of the techniques that have been employed in the previous blocks. 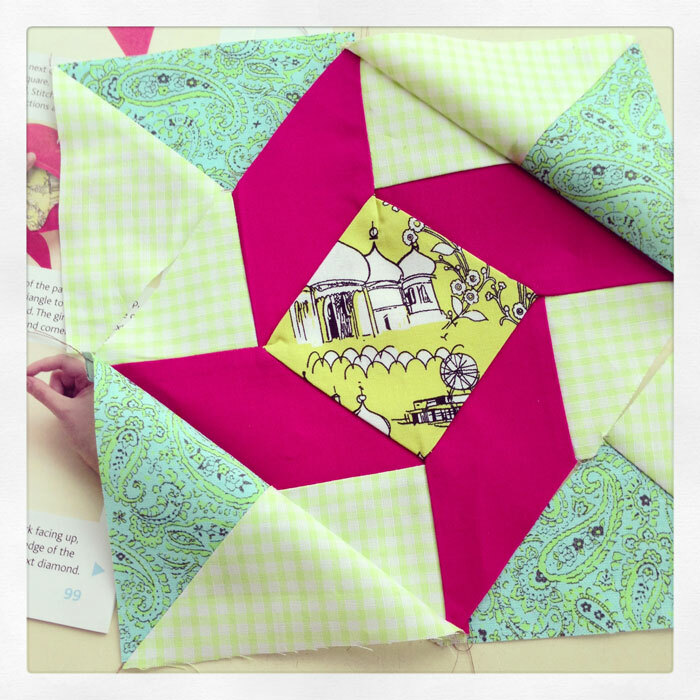 Diamonds were sewn along each edge of the Brighton Pavilion square, then the small green gingham triangles were inset in between the red diamonds to make a square. The remaining large triangles were joined in pairs and then sewn to the outside edges of the block to make a larger square… simples! Or not… if you try and rush it. I completely forgot that I had previously cut these pieces out, so all I had to do was whip them up. But as the old saying goes, more haste, less speed. Indeed! I sewed the outer pairs the wrong way round which resulted in the gingham pieces sitting together. I thought I might get away with it but it would have been a forever niggle. So I unpicked, albeit sulkily! Apart from concentrating to make sure all the right pieces are sewn on the right way, you also need to be so accurate and consistent with those seams. One wayward line of stitching and it all goes belly up! Name: Windblown Square or Star. History: Also known as Balkan Puzzle. Nancy Cabot recorded this name in the Chicago Tribune in the 1930s. Thought to reflect the complex politics of Eastern Europe in the early 20th century. Level: Straightforward to assemble but accuracy with set in seams is a must. Cor what a hair curler that one is! Can’t wait to see them all together, any chance of a progress view? Huh? Huh? I too really want to see these blocks together 🙂 This block is fantastic, super precise.